After being taken as an infant from her home in Africa, Barbara spent 30 years of her life being shuffled and resold to numerous labs, ‘making the rounds’ for various studies. Along the way, she was also used as a ‘breeder’ having her infants taken from her after birth – no doubt for a similar destiny. Barbara now exhibits a bright personality, and is a cheerful chimpanzee – blowing kisses at staff and seeking attention and interaction. Her happiness fits her like a glove. My personal nickname for her is Miss Sweetheart. Over the last few blogs, I have talked about some of the issues concerning sanctuary life operations, and the how-to of caring for the incredible animals living with us here at Primarily Primates. Today, to call attention to the plight of animals used in research as part of World Week of Animals in Labs, I want to tell a story about results that we have been privileged to witness for one remarkable resident – a chimpanzee named Barbara. Barbara was taken from as an infant from her home in Africa and brought as a captive to a research facility in 1969. Like all chimpanzees with such unfortunate beginnings, the plan for Barbara was not freely roaming in her wildlife home – instead it was for a darker reality at a lab. She spent the next 30 years of her life being shuffled and resold to numerous labs, ‘making the rounds’ for various studies. Along the way, she was also used as a ‘breeder’ having her infants taken from her after birth – no doubt for a similar destiny. Barbara’s plight didn’t end in the lab. She came to Primarily Primates in May 2005, with a group of chimpanzees, after having been a ‘working chimpanzee’ for wildlife entertainment. As you may imagine, by the time Primarily Primates rescued her, Barbara was shy and withdrawn – the sight of yet more unfamiliar faces simply meant a new form of misery was in store she must have figured. Instead, she received loving caretakers who had an entirely new plan for her future. Over time, her new ‘family’ has helped coax Barbara out of her shell. Ultimately, Barbara has come to realize she really would be cared for, and never harmed as she was before. Barbara was able to experience the miracle of trust. For many years, Barbara shared a habitat with a very acrobatic chimpanzee named Bubba, who was also from the entertainment industry. 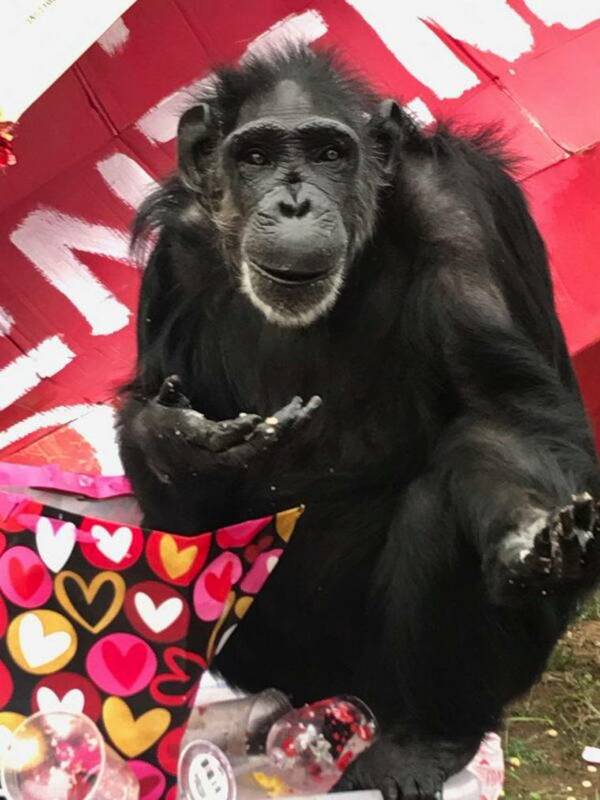 She recently has moved in with another chimpanzee pair – Shu Shu, who also endured life in a lab, and Jason, who was used behavioral studies. They form a very close-knit trio, and are perfectly suited for life together. In early 2014 all of their lives were changed with the introduction of a Primadome enclosure (aka Oliver’s Playscape when it opened), a large playground with climbing towers, ropes, and toys for their enrichment. The new exercise and play facilities have encouraged her personality to continue to evolve. Now, resting from her exertions, she can be observed lying on her side in the green grass on balmy days, simply enjoying the pleasure of that moment – with the knowledge of her cruel past only a dim memory. Visit PrimarilyPrimates.org if you would like to be a sponsor for Barbara (or another of the many chimpanzees that reside with us), and help support her happy future with Primarily Primates.